That which has been is what will be, That which is done is what will be done, And there is nothing new under the sun – Ecclesiastes 1:9 NKJV. Progress, far from consisting in change, depends on retentiveness. … Those who cannot remember the past are condemned to repeat it. From The Life of Reason (1905- 1906) by George Santayana (1863-1952). As I write this editorial Christmas is just around the corner. It seems hardly yesterday when 2011 began and now we are near its end. Several people have remarked to me that it feels like time is speeding up. Does the Bible and/or science provide a clue, I wonder? ... except those days should be shortened, there should no flesh be saved: but for the elect's sake those days shall be shortened - Matthew 24:22. The Earth is known to constantly slow down and speed up, which imperceptibly alters the length of our days. We are taught that the day is 24 hours, or 86,400 seconds. That is true, but there are irregularities on the millisecond level. Meanwhile Richard Gross of NASA's Jet Propulsion Laboratory in Pasadena, California, USA has calculated that the magnitude 9.0 earthquake that ravaged Japan on Friday, March 11, 2011 also shortened Earth's day by 1.8 microseconds and shifted the Earth's axis by about 6.5 inches. By changing the distribution of the planet's mass, the quake likely caused the Earth to spin a tiny bit faster, thus shortening the time the planet takes to rotate each day. The change is imperceptible so the Bible statement and data from science produce a speculative clue at best. That aside, Calendar events, including Christmas, just come and go and those of us who try to work to “dead-lines” seem to have less time to do it. We hope to have this issue of CETF in circulation before the end of the year, which is a big ask. This year Christmas falls on a Sunday, something that won't occur for another five years, 2016. How old will you be then? I think I'll give the thought a miss!. So teach us to number our days, that we may apply our hearts to wisdom - Ps 90:12. Due to the aforementioned coincidence CWM-F will hold a Christmas day service this year, which is not a regular occurrence with us, not that I personally object to such a custom. However, recognising the pagan origin of the “Church” festival, we have chosen always not to make much fuss about it. We think it's legitimate and good to use the opportunity for witness, so some will go carolling. On Sunday/Christmas morning, we will use the occasion as an opportunity for “evangelism” by the children as they present the nativity scene and the message of the Incarnation—when God became man and dwelt among us in the person of the Lord Jesus Christ; EMMANUEL God with us (cf. Matthew 1:23). All this has happened before and until Jesus Christ returns it will continue to happen, which leads me to another point relating to the Ecclesiastes verse and the George Santayana quote above. 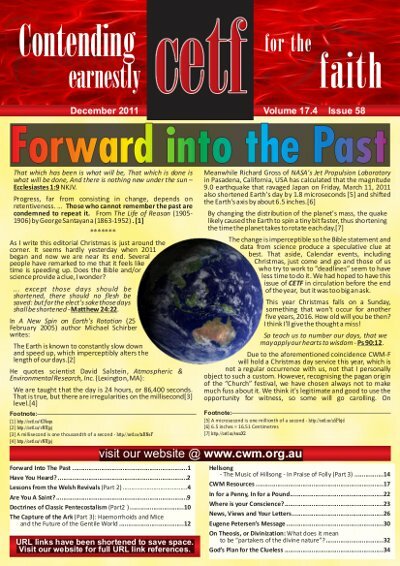 In my previous editorial I promised to “include a report of the CWM Conferences on The Vanishing Gospel and the Call to Preach the True Gospel” which were conducted throughout Australia and New Zealand in September 2011. A new website was launched for the purpose – www.thevanishinggospel.com – which we plan to continue and up-date as required. It is not a new theme and certainly no-one can claim originality or copyright to the idea. Ever since the Gospel of Christ was first preached the Kingdom of God has been advancing and extending. Throughout that time the True Gospelhas been under attack. The problem, in our time, is that treachery among leaders is unprecedented and the "dumbing" down among the populace so widespread that the trumpet must constantly sound an alarm and a call to arms. This in essence is a summary of the purpose of the CWM Conferences in 2011. Well that depends on your yard stick. Numerically the conferences and rally meetings certainly reached more people than our previous “in house” annual Conferences which attracted 80+ people to each annual event, mainly from Australia and New Zealand with a few international travellers. Conservatively we can say that this year there were 80 people in each of the Conference venues—Sydney, Melbourne, Palmerston North, Brisbane and Adelaide—and at the rallies—Auckland, Hamilton, Bulls, Wellington (Lower Hutt) and Christchurch—a conservative estimate of say 800 different people. That's not huge by modern standards but as I say it depends on your “yardstick”. Financially we reached a break-even point as we have always done since the Conferences began in 2004. There were three international and five national speakers whose travel and incidental costs were met as were the administrative costs at all of the events. We are grateful to the Lord for His goodness and to His faithful people for their kind support. The teaching is available through the CWM Resource. I encourage you to purchase the DVDs or CDs as full sets. The messages will challenge and inspire you and could prove to be life changing as the Holy Spirit quickens truth. Future Conference plans are uncertain at this stage. Originally the idea was to have national regional Conferences one year and to return to the international, inhouse Conference the following year. A decision will be made and our readers advised as soon as possible. In the meanwhile please pray for the guidance and blessing of the Lord in respect of future plans. Finally, as with all previous CETFs, I commend the following writings and writers to your prayerful diligence. It is fairly certain that former Jesuit trained priest Richard Bennett and former Roman Catholic, Thomas McMahon will be visiting Australasia in 2012 under the auspices of CWM. Happy Christmas - Please help us circulate the message by distributing CETF far and wide.